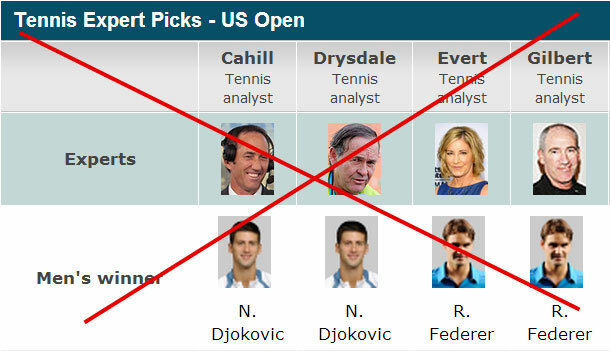 For those outside of the America, ESPN get expert people to make the predictions on the tennis before the tournaments. I am formerly letting everybody know that the “picks” that were made today were incorrect. 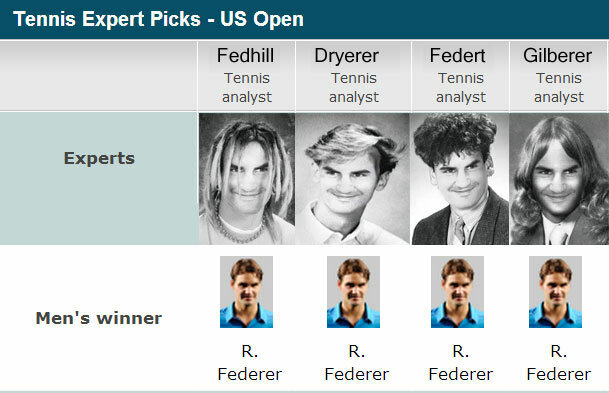 On behalf of ESPN I apologise for their administrative error. They have assured Me that the appropriate staff have been fired. 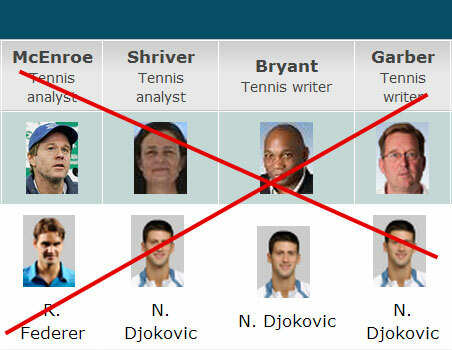 I welcome the new and more sensible experts to the tennis game and look forward to meeting them soon. An error or an overly vocal Serbian conspiracy by ESPN? Either way, I’m glad You addressed and solved the problem. On another subject, can You reflect on the birthday party held in Your honor last night. It appears Mr. Haas was there, along with a few of Your fashionable friends. We look forward to Your humble description. Unlike Prince Harry, what goes on at My party, stays at My party. But thank you for making the enquires. Thanks for the comments Heath one. My staff are making the contacts. 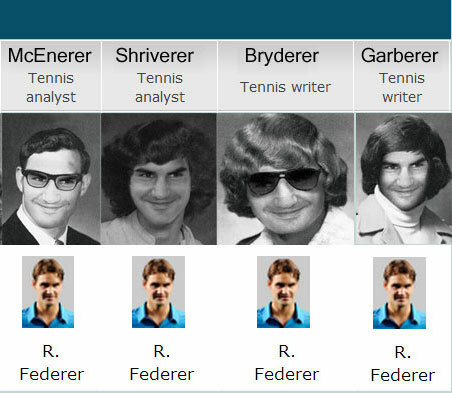 hey….i find it a lil weird dat how m i fan of federer and pseudofed @ d same tym…………….totally loved dis one…..SUPERCOOL !!! » Change display pic in the picks to the one in your profile. will these experts also take place in the comentary boxes? I would think they can assure Your name being mentioned in each and every match of every event (wheelchairs included). That way You will not have to depend on the Sue Barkings’ of this world, who do tend to force the issue of getting close to You (and Your divine behind). PS: Was expert #2, Mr. Dryerer, actually a member of Modern Talking in the past? Rather amusing and of course you’re right to feel affronted. But don’t be putting the carts before the horses. It is also worrying that in these days of recession you are always in the hurries to fire people and remove them from your Christmas card list. The photographs of the new experts frightened me a little. They all have the big noses with which to blow the hot air. And their smiles are very creepy. This should not be shown to people of a delicate nature. Feeling personally offended by Mr. Cahills’ recent Tweetings, suggesting that Your staff might forget charging the Fedberry. Is this how he makes his applicationings for joining Your staff ranks, since he was fired from the “expert” pannel on ESPN? Kind regardings and enjoy winning today.